Suitable for private and public interior EB + walls and shower receivers in private premises. 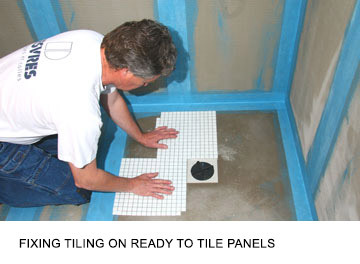 May be used to fix coated expanded or extruded polystyrene foam panels in humid areas. Always check the correct fixation and stability of the panels as per the manufacturer's recommendations. • Wall panels: Private EB+ and public EB+ areas such as residential buildings, offices, schools, hospitals, hotels, etc. • Floor shower receivers: Private EB+ areas such as individual showers. The installation of the framework, the mechanical fixation, the installation of the shower receiver, the treatment of the different junctions and particular points (dealing with the trap, etc.) must be carried out in accordance with the manufacturer's instructions. The format and the type of ceramic covering: refer to the AT technical autorisation or the regulations in force. Fixing the tiles: 24 hours minimum after fixing the receiver panels. Jointing: 24 to 48 hours after fixing the ceramic covering.